From the Association of American Railroads: Rail Time Indicators. AAR reports that "2009 saw total carload traffic on U.S. railroads at its lowest levels since at least 1988, when the AAR’s data series began." 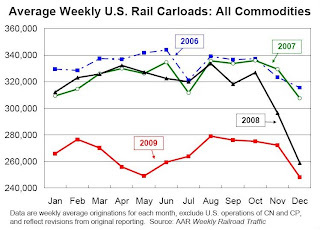 This graph shows U.S. average weekly rail carloads. It is important to note that excluding coal, traffic is up 6.9% from December 2008, and traffic increased in 12 of the 19 major commodity categories. Housing: In addition to the decline in coal, two key building materials were also down YoY from December 2008: Forest products and Nonmetallic minerals & prod. (like crushed stone, gravel, sand). This fits with the recent data on housing starts, new home sales, and the NAHB home builder index that shows residential investment is flat and non-residential investment is declining sharply. • Good riddance to 2009. U.S. freight railroads completed a very difficult year by originating 1,241,293 carloads in December, an average of 248,259 carloads per week. That’s down 4.1% from December 2008’s average of 258,915 carloads per week and down 17.6% from December 2007’s average of 301,466. • Rail traffic always falls sharply in late December due to the holidays. This year, unusually heavy early-season snow in parts of the country also negatively affected rail traffic. • Total U.S. rail carloads in December 2009 were 53,281 lower than in December 2008, mainly because of coal. Coal was down 96,022 carloads in December 2009 from December 2008. That’s equal to 19,200 fewer coal carloads, or around 175 110-car coal trains, per week. Rail carloads excluding coal were 42,741 (6.9%) higher in December 2009 than in December 2008. • It’s useful to compare current rail traffic levels to the collapsed levels of a yearago. To use a boxing analogy, doing so shows if rail carloads have gotten up off the mat after nearly getting knocked out. And, in fact, for many commodities that seems to be happening. 12 of the 19 major commodity categories tracked by the AAR saw higher carloads in December 2009 than in December 2008. The AAR report has a number of other graphs for various sectors like autos and housing.